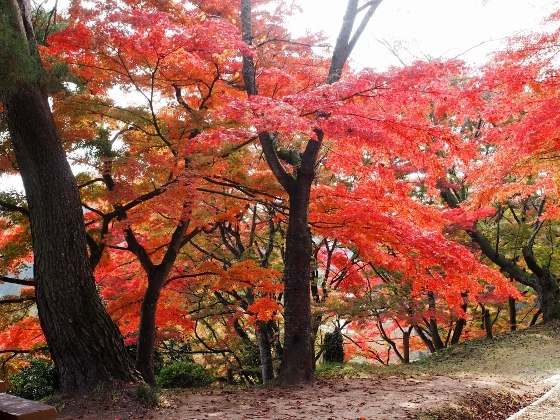 Today I visited Kasumigajo Castle Park in Nihonmatsu City. The park is designated as a National Historic Site. 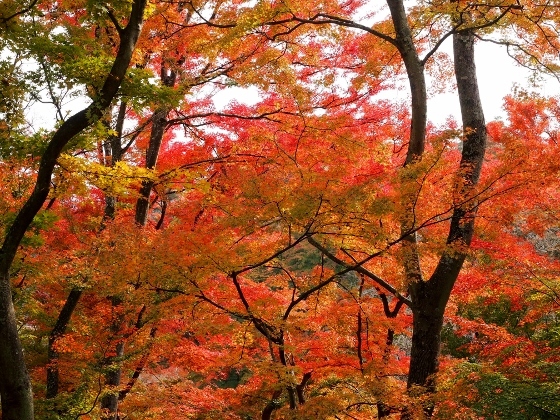 Autumn colors of maple trees were best to see today. 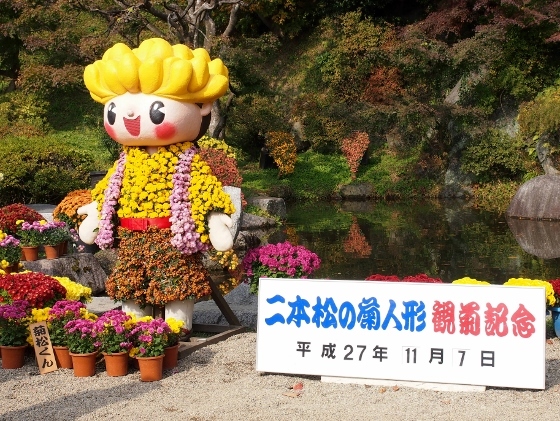 Chrysanthemum Doll Festival is now being held at the site. 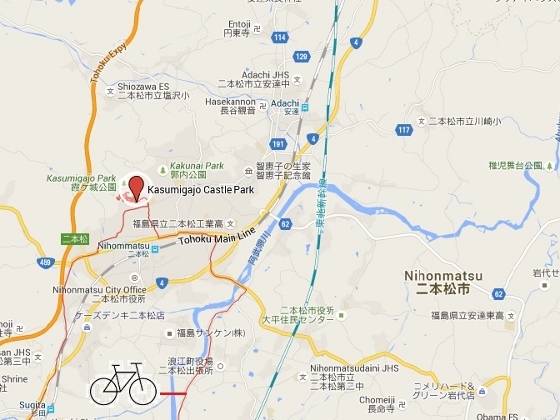 At the entrance of Kasumigajo Castle Park, there is a bronze statue of boys called Nihonmatsu boy soldiers. They lost their lives in Boshin Civil War in the last days of Tokugawa Shogunate Period. 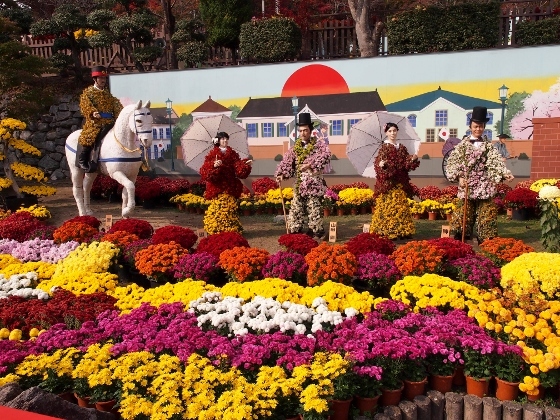 The statue was surrounded by chrysanthemum decorations as shown above. 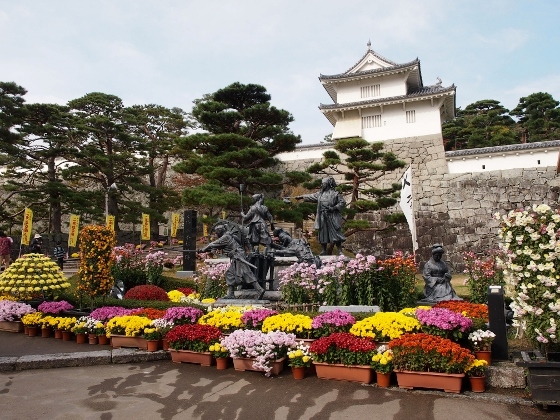 Behind the statue you can see the main gate of the castle called Minowa Gate. 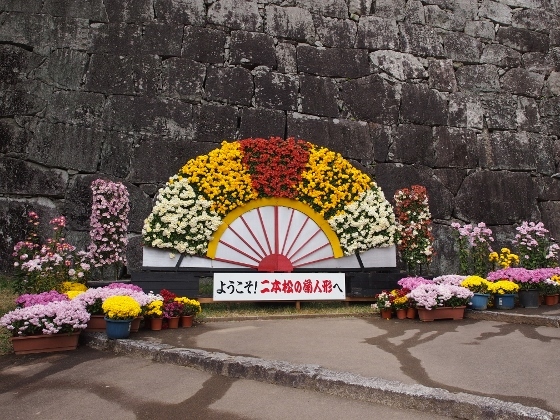 Here is the welcome Japanese fan decorated with chrysanthemum flowers in front of the castle stone wall as shown above. At first I walked around the garden in the park. There was a Japanese style garden with small ponds. 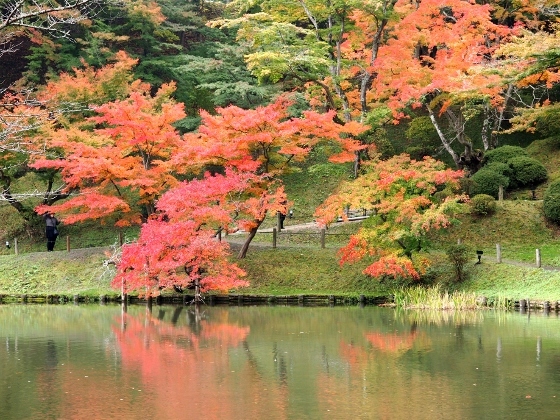 Picture above shows beautiful autumn maple trees around Ruri Pond. 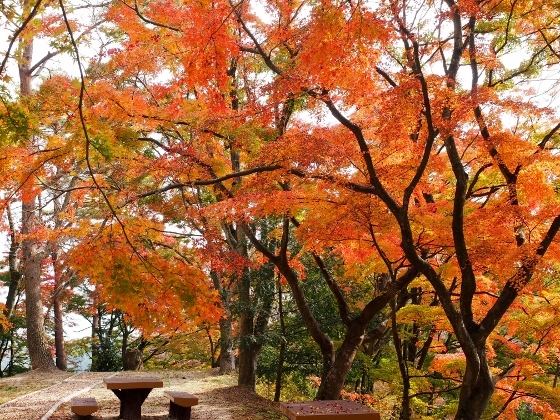 I walked further to the upper area of the Kasumigajo Park and there I found more of the red and orange colored maple trees as shown above. They were really marvelous. 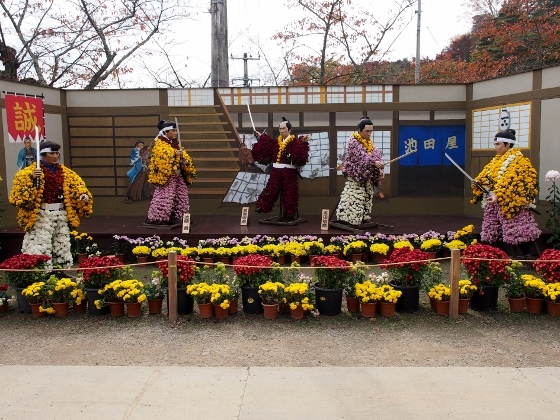 Being satisfied with plenty of maple colors, I finally entered the Nihonmatsu Chrysanthemum Doll Festival area. 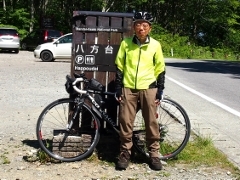 Entrance fee of 700 yen is required. Mascot character of the festival "Kikumatsu-kun" welcomed us as shown above. 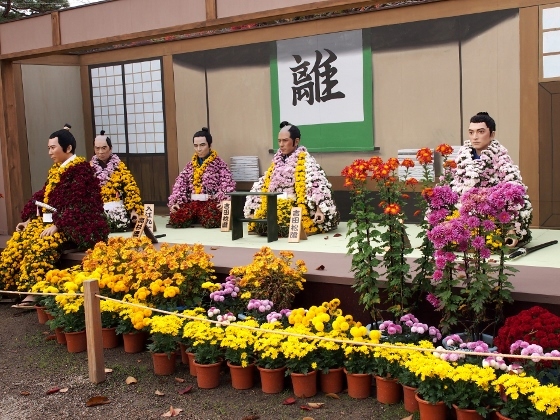 This year, the main theme of the festival is the Japanese history during the last days of Tokugawa Shogunate Period. 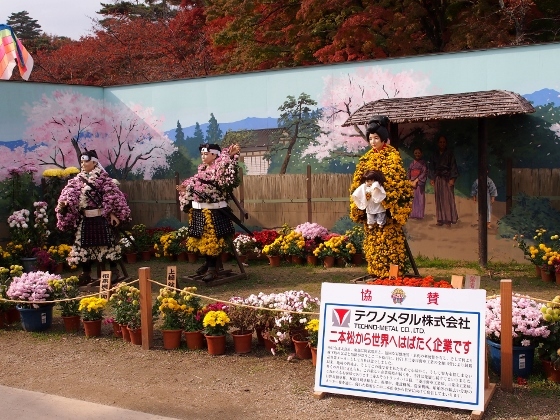 There were some displays of chrysanthemum figures featuring the scene of arrival of a black foreign ship, Ikedaya Incident, private school for restoration study called Shokasonjuku, and Boshin Civil War (Nihonmatsu boy soldiers leaving home for battle). These scenes are shown above.